Renewed tensions in a decades-long standoff between the U.S. and North Korea are likely to worsen the already distrustful views Americans have of the totalitarian state. Gallup first asked Americans about Korea just after the Korean War began in June 1950, and in the 67 years since, it has measured public opinion about the still-divided peninsula in many different ways. Americans have long viewed North Korea warily. Several months before President Donald Trump's "fire and fury" warning against North Korean nuclear threats, Americans already had low favorable views of the country; North Korea remained the least favored of 21 countries Gallup polled on in February. Perceptions of North Korea began to grow markedly more negative under President George W. Bush, who assigned it membership in the "axis of evil" in his 2002 State of the Union address. Whereas about three in 10 Americans (31%) had a favorable view of North Korea in 2001, this fell to just 8% by 2003 -- matching its record low in favorability. Gallup began tracking North Korea's favorability among Americans in 2000. The country has been viewed least or second-least favorable among a list of countries since 2003, reaching its lowest rating of 8% twice -- in 2016 and in 2003. Its current rating of 11% isn't much better. Americans have also consistently named North Korea as one of the greatest enemies of the U.S. since 2006, when Gallup began asking the open-ended question. North Korea was named as the top enemy in 2016 and among the top-three enemies in all but one poll since 2006. North Korea's threats have cropped up as a major concern under previous presidents as well. In 2013, under President Barack Obama, 83% of Americans labeled North Korea's development of nuclear weapons a critical threat, ranking atop the list along with Iran's nuclear development. More recently, in 2016, a majority labeled North Korea's military power as a critical threat. In 2013, Gallup asked a question about coming to the aid of South Korea, as the U.S. did in the Korean War, and a slight majority of Americans (55%) said the U.S should defend South Korea if it was attacked by its northern neighbor, while about a third (34%) said it should not. In recent months, Gallup has noted a bump in the percentage of U.S. adults who name the situation in North Korea as the most important problem facing the U.S. Though 4%, recorded in both July and August, doesn't constitute a large percentage of those who name it as their top concern, rarely in the past has North Korea garnered even 1% of the mentions in a given month. However, this issue did appear at 4% once before in 2013, as North Korea continued a series of nuclear tests. More than 60 years prior to that, the Korean War appeared at the top of the most important problem list in 1951 and 1952. Since 2001, situations in other countries have also been named among the most important problems according to Americans -- such as Afghanistan, China, Russia and Syria, which garnered similar figures to North Korea, and the situation in Iraq, which was frequently named as the most important problem throughout the 2000s. So, while North Korea's recent advancements in nuclear technology present new challenges to the U.S. in keeping international peace, Americans have long had North Korea on their radar as a threat. With tensions running high as Trump has taken a markedly different and outspoken tact from his predecessors in dealing with Pyongyang, this is unlikely to change soon. Government, Healthcare Most Important Problems in U.S. Dissatisfaction with aspects of the U.S. government remained the most important problem this month, while healthcare was not far behind in Americans' concerns. 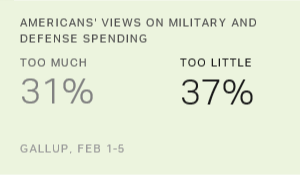 Although President Trump has called for an increase in military spending, most Americans say the U.S. spends either the right amount or too much on defense. Nearly three times as many Americans say the U.S. ranks No. 1 in the world militarily (57%) as say it ranks No. 1 economically (20%).